This dish looks really good and is really very little effort. Perfect for last minute entertaining. Wine Suggestion: We’ve successfully drunk fresh whites like Pecorino from Italy and crisp Sauvignon Chardonnay blends from Cheverny, Loire as well as Chianti, Rioja and cool-climate Syrah/Shiraz from Australia and the have all gone very well. This is a sociable dish so think of a sociable wine and it seems to work a treat! Put the potatoes on to steam. Mix the olive oil, chilli flakes and celery salt in a large tray. Add the lamb chops and turn to coat well in the oil. Leave to marinate for 10 minutes. Heat a large, heavy, non-stick frying pan and fry the chops over a medium heat for 5 minutes (you won’t need any extra oil). Turn the cutlets over and cook for another 3 minutes on the other side (or longer if you prefer). Meanwhile, drain the steamed potatoes once they are tender and leave to dry in the pot. Use the rocket to line a platter. 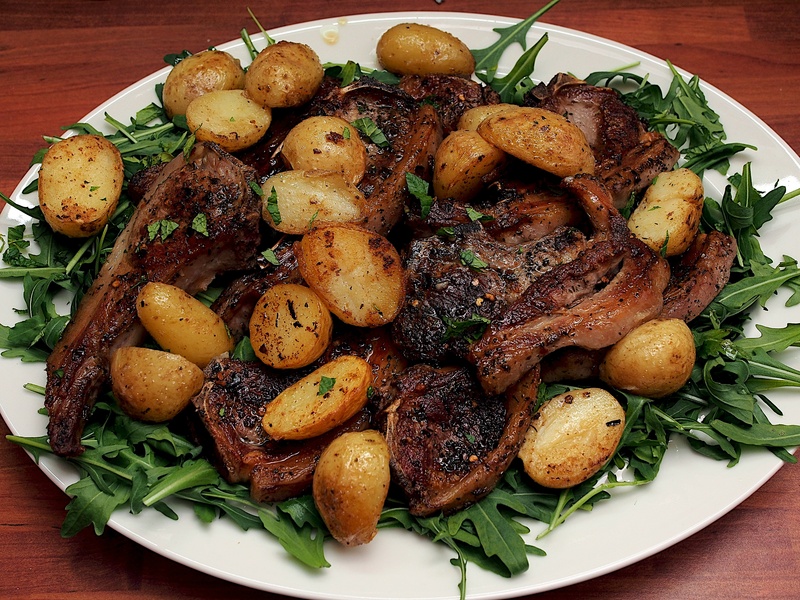 When the chops are cooked remove them from the pan and arrange on top of the rocket. Add the potatoes to the pan and fry for 3 minutes on each side or until hot and golden brown. Use a slotted spoon to transfer to the platter. Sprinkle the dish with the sea salt and fresh herbs to serve. This looks hearty and delicious and I love how you have served it in a platter. Sometimes this is the better option rather than putting food on everyone’s plate as they can choose exactly how much they want to eat. Although slow eaters might miss out! that looks real good indeed!